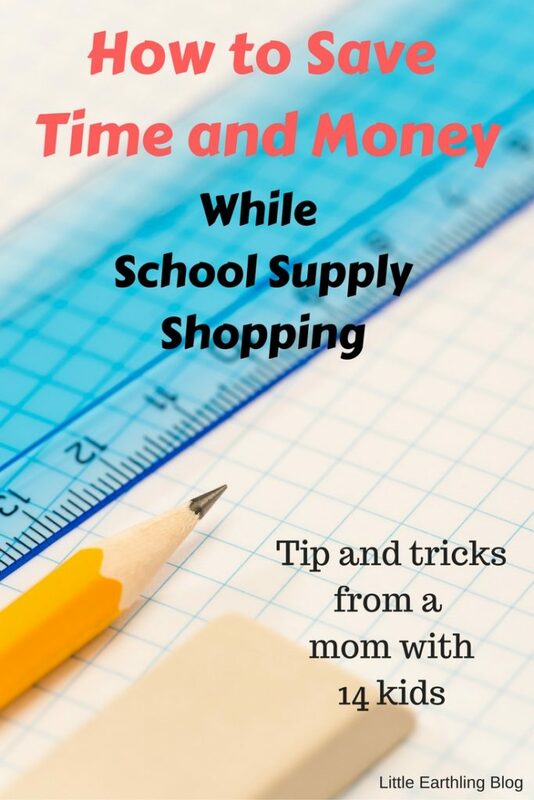 School Supply Shopping: Save time, money and your sanity. I thought I was going to be all clever and tell you how I ordered all of my kids’ school supplies online between Amazon and Walmart. Except it didn’t quite work out that way. Last week I got the kids’ lists, compared prices and filled one cart on Amazon and one on Walmart; all from the comfort of my own home. Awesome, right? Except some of the items from Walmart (like $0.17 notebooks) had to be picked up in store and some had to be shipped….well, that wasn’t as convenient as I hoped. So I started over. I grabbed the Walmart ads (I shop at Walmart regularly; it has cheap prices and great parking) and pulled up Amazon to compare prices. But do buy stuff you need. This year three of my children need pencil boxes. I know have a stack of at least eight right here in the house. There is no reason in the world to buy new ones (even if they are only a buck) if I already have them. School ended less than three months ago. Those pencils boxes did not spontaneously combust nor were they stolen by school-supply-thieves, so I am reusing them. Same for scissors. Apollo needs one pair and Avi and Tucker need adult scissors. We still have the ones from last year, so out they came. Brand new supplies are neither a necessity or rite of passage. I went shopping last weekend while Chuck had all the kids up at his parents house (I had to stay home because I was on-call for a birth). Alone meant I had no one begging for extra supplies, more expensive supplies or unrelated supplies. I got what was on the list and nothing more. 3. Buy Plain Supplies (your kids won’t die, I promise). Being alone made it easy to pick up the supplies in plain, functional designs. No Lisa Frank (remember those?) or licensed characters. Just good, old-fashioned school supplies. This also meant no arguing over supplies. I bought them, sorted them and it was over. I shop at Walmart for all of our toiletries, paper supplies, etc. I do it because it is geographically convenient and cheap. I also shop at Amazon all time. Amazon Prime? Delivered right to my door, usually at the cheapest price possible? Yes, please. In this case I headed to Walmart first and came home and ordered the rest of the needed supplies from Amazon. Two days later they were at my door. This was by far the easiest (and cheapest) year I have had when it come stop school supplies. I ended up spending $76 at Walmart and another $17 at Amazon…buying supplies for six kids going back to school. If you are not already an Amazon Prime member, use my affiliate link to get 30 days free membership! What are your tips? Anything I missed for next year? I would take advantage of the lost leader supplies like the 17 cent notebooks, cheap filler paper and pens and pencils. If there was a limit, I’d buy the limit, take them to the car, and go back and buy the limit again. I also bought more than the required first day of school lists items like pens and crayons, things I knew my boys ran out of mid to end of the school year. I also took the time and used fine point sharpies to label every pencil, pen, crayon and notebook. Not on the lists but if you have to provide folders, and notebooks: I bought rolls of clear Con-tact paper and covered the outside of the folders and cut it long enough to fold up and onto to inside of the pocket and reinforced the fold of each folder, they last longer. My boys went to a church school and we had to buy work books, which also got a cover of Con-tact paper. I put all of the extras in a clear storage tote so we knew where they were. Yes, I always buy TONS OF the loss leaders. They have been supplying our homeschool for many years now. Thankfully all my kids school supplies are provided. I am so jealous! I had a friend on FB telling me about that. I’m (or I should say a certain next door neighbor boy) is re-using last year’s composition books and spiral notebooks — they used maybe a handful of pages last year, so why buy more? I tore out the used pages and voila, back to school they go. Ditto pencils, glue sticks, erasers, scissors, pencial box, pencial sharpner, bindes, folders, paper etc! I have a bin I put all his unused (or hardly used) items in when they come home at the end of the year that I compare against the list before first buying anything. Then, I watch the ads – I’m only buying for two kiddos, so it isn’t a huge deal to spread my shopping around. After a while you get to know what’s truly a good deal and what’s not And, while I have been known to splurge here and there on a character or licensed item, I’ve also cut up a used Seahawks folder and glued the logo, etc. onto a cheap three-ring binder for that ‘licensensed item’ feel :-). I love this Kris! I just read your comment to Tucker. The boys will be in good company. I love your idea of reusing the Seahawks logo too.